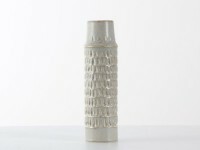 Herta Ottilia Bengtson, ceramist and designer, is born in Ysane in Sweden in 1917. She showed an early interest in drawing but family finance situation did not allow for any such studies. Instead, she entered a school for porcelain painting, and in 1937 when she turned 20, she got a job at Hackefors Porcelain Factory in Linköping. The same year, she marries Turner Emil Bengtsson (1912-1977) and two years later, she becomes the Head of Department at Hackefors factory. Herta leaves Hackefors in 1941 and moves with her husband to Lidköping. There, she was employed as a designer at Rörstrands. She stays there for 23 years. She creates several famous tableware items, best known being the Blue Fire series, produced between 1951-71 was produced and became one of Rörstrands’ best sellers. She leaves Rörstrands in 1964 for new challenges. She joins Andersson & Johansson in Höganäs, where she starts working with sandstone. Between 1969-8, she works as a freelance artist and designer for Rosenthal. During the 1970s, she becomes interested in the glass art. She dies in Sölvesborg in 1998. Her signature is " HB " , and " Bengtsson " for unique pieces.